Portland is a fascinating place, especially to a San Franciscan. It represents much of what we used to be (alternative, weird and reveling in our subcultures, before the influx of tech bros and startup money) but with the same high standards for food and cocktails that we have only recently grown to expect. Perhaps that’s why it was so easy to immediately feel at home there. The restaurants, bars and coffee shops all reminded me of SF, only often with lower prices. The neighborhoods were very walkable, and the people were all so friendly. I would go back in a heartbeat. Pine State Biscuits – I was pleasantly surprised to see so much Southern food in Portland. When I heard Pine State Biscuits had a fried chicken, bacon and cheese biscuit sandwich topped with gravy (and for $8, no less – which would be unheard of in SF, by the way), I was sold – and I was not disappointed. Society Hotel – I debated long and hard whether to stay here or the Ace, but I’m so glad I settled on Society Hotel. This is a newer boutique hotel with a stunning café (complete with a fireplace and industrial furniture) and rooftop (BYOB). The rooms are simple and minimalist, with industrial-style décor and memory foam mattresses. Expatriate – Asian-inspired food and drinks done right by husband-and-wife team Kyle Linden Webster and Naomi Pomery (who, by the way, has a James Beard award under her belt). The shrimp toast was unbelievable, but supposedly the real draw are the wonton nachos, available only after 10pm. Grain & Gristle – Unfortunately, I didn’t get to try their food, save their glorified “slim jims,” but the wine and beer selection were fantastic. Also, the outdoor patio was lovely on a hot summer day. 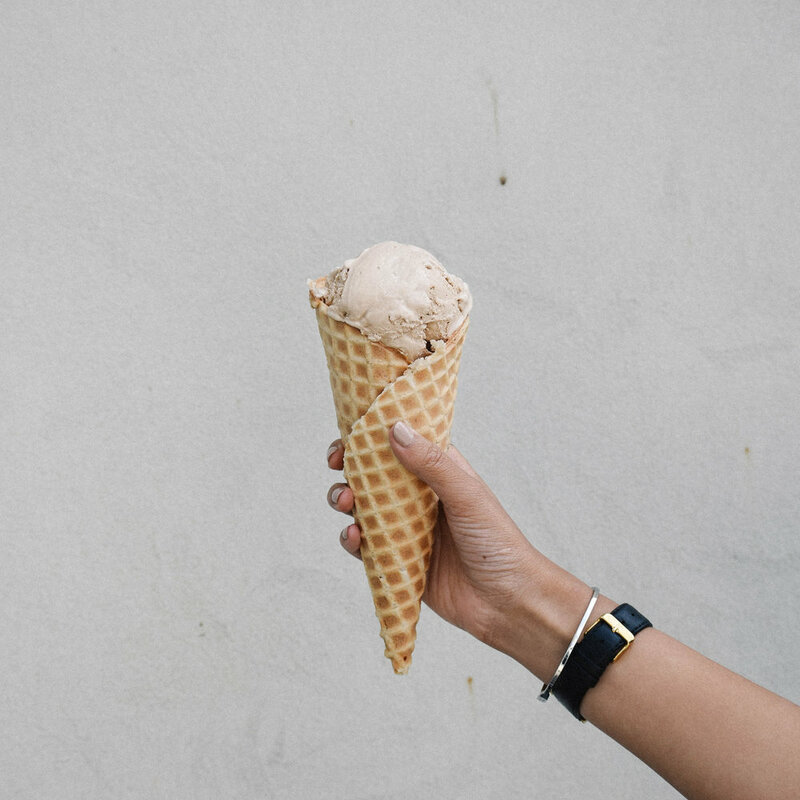 Salt & Straw – This is Portland’s Bi-Rite, notorious for its long lines but beloved for its delicious ice cream. I heard horror stories about wait times but I strolled right in at 11am on a Monday. I was thoroughly impressed with the Stumptown cold-brew coffee ice cream, as well as their waffle cones which are made in-house. Little Bird Bistro – This was our first stop upon arriving on Sunday night, and it turned out to be one of our favorite meals of the trip. Since it was just the boy and me, we shared a charcuterie board and roasted bone marrow bones (safely the best we’ve ever had). Our only regret is that we didn't come with a larger party so that we could sample more dishes. Tasty n Alder – Another phenomenal meal, though keep in mind we had to wait in line for 30 minutes on a Tuesday afternoon, so I can’t even imagine what it’s like over the weekend. The raddichio salad with bacon lardons, manchego and a six minute egg was insanely good, along with the smoked trout and accoutrements (no words for how tasty this was – just look at the picture). The bim bop bacon & eggs were also great, though I’d recommend skipping the Korean fried chicken (not worth the hype). Ace Hotel – If you’re not staying here, then at least come by to snap that iconic lobby photo, and grab a coffee at Stumptown / a cocktail at their bar/restaurant Clyde Common (FYI they have awesome food and drink deals at their daily happy hour from 3-6pm). WM Goods – Also known as well.made.goods, this boutique is bright and airy, with beautiful things galore (shoes, plants, candles, books, watches, you name it). McMenamins Kennedy School – This was perhaps one of the coolest concepts for a venue ever: a school-turned-hotel, with a soaking pool, movie theater, restaurant and brewery (though my favorite was the cocktail bar in detention hall).